Boy it sure is good to be king! Nothing wrong with looking really good while doing it either! 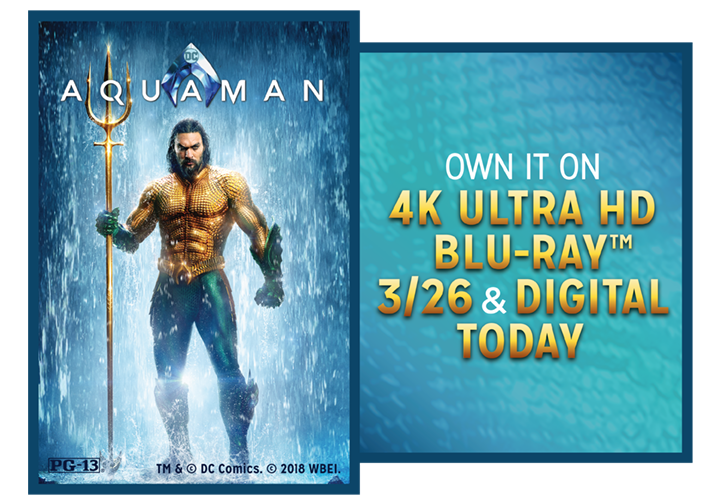 To celebrate Aquaman, the latest entry into the DC universe, you can enter below for your chance to win one of 20 digital copies and see it for free! Aquaman reveals the origin story of half-human, half-Atlantean Arthur Curry and takes him on the journey of his lifetime—one that will not only force him to face who he really is, but to discover if he is worthy of who he was born to be… a king. MUST REDEEM DIGITAL MOVIE OFFER BY 3/31/2020. Consumer must reside in the U.S. and register for a digital service provider account (go to wb.com/RedeemMovie for a list of digital service providers (e.g., Movies Anywhere). May only include HD main feature. NOT COMPATIBLE WITH ALL DEVICES. SOME DISPLAY RESOLUTIONS MAY NOT BE AVAILABLE FOR STREAMING OR DOWNLOAD ON ALL DEVICES FROM ALL DIGITAL SERVICES. Consult your digital service provider for compatible devices, available display resolutions, streaming and download capability and Terms of Service. Ultimate display resolution on playback is dependent upon connection and device characteristics, including screen resolution. High-speed Internet connection required. Go to wb.com/RedeemMovie for additional details, requirements and technical support. Neither Warner Bros. Entertainment Inc. nor any affiliate is responsible for maintaining any digital service. THIS DIGITAL MOVIE OFFER MAY NOT BE RESOLD OR OTHERWISE TRANSFERRED.